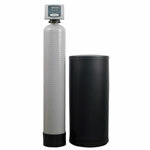 A water softener is a special type of filter that removes the calcium and magnesium in hard water by using plastic beads and cleans itself periodically by a process called "regeneration." Water softeners have three main components: a mineral tank, brine tank and control valve. Smaller capacity models combine the mineral tank and brine tanks into one cabinet, but the two tanks are still separated within the cabinet. The mineral tank is where the water filtration takes place and the hard water is softened (calcium and magnesium are removed).The brine tank is where a solution of salt or potassium is stored. The control valve is the device that controls the flow of water into and out of the mineral and brine tanks during regeneration. Using a unique crystalline media, Sanitizer conditioners effectively remove hardness, iron and manganese while raising low pH level — all in a single pass. The chlorine generator safely sanitizes the entire media bed to remove nuisance bacteria and related odors. Installing an acid neutralizer is the most effective and economical way to correct a low pH imbalance of your water. The signs of acidic water - if you have copper pipes - are blue or green stains in the bottom of your tub or sinks. If you have low pH, acidic water not only can create these stains, but can also, over time, damage your copper water pipes and create pinhole leaks. By installing an acid neutralizer, you can possibly slow down or stop the problem at its source. Essentially, this can save you a lot of money in the long run by not damaging your fixtures and copper pipes and building.